Stock status is current as of 4/22/2019 4:29 AMET. Reliable and efficient, the Samsung 850 EVO Series SSD is just the kind of SSD you need for your computer. Compatible with all types of slots and connectors, the drive can also be used for ultra-thin systems such as laptops and tablet PCs. Equipped with Samsung's advanced 3D V-NAND flash memory, this SSD delivers superior quality performance. It features vertically stacked 32-cell layers, which result in higher density and a smaller footprint. When operating in Device Sleep mode, it ensures better power efficiency. Also, this SSD comes with a Samsung MEX controller, which further enhances its energy-efficiency and helps in reducing power consumption. This Samsung 850 EVO features a one-stop install navigator, which helps you multitask, simultaneously download multiple applications and ensure quick and efficient data transfer. Featuring up to 540Mbps and 520Mbps sequential read and write speed, this Samsung 1TB SSD offers an enhanced computing experience. With the Samsung Magician software, it activates the rapid mode to make use of the unutilized PC memory and deliver improved random read and write speeds. This SSD comes with a Samsung 1GB low-power DDR2 SDRAM for optimum system performance. 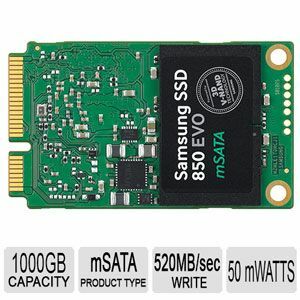 Featuring a full-disk AES 256-bit hardware encryption engine, this Samsung mSATA SSD secures your data, while preventing any kind of performance degradation. This drive can be easily integrated with Microsoft e-drive IEEE-1667 for protection of your data. Also, its Dynamic Thermal Guard maintains the ideal temperature, thereby enabling smooth operation. In case the temperature rises above the threshold level, the Dynamic Thermal Guard brings down the temperature to protect your data and prevent your computer from overheating.